Donate $100 or More and Get 20% off H2M 2019! Donate $1000 or More and Get 100% off H2M 2019! On behlf of the entire Explore Mars team, I would like to personally thank you for being such a strong supporter of Explore Mars, Inc. and of the humans to Mars mission. We have made amazing progress over the past several years, but there are still no guarantees that humans will walk on the surface of Mars any time soon. 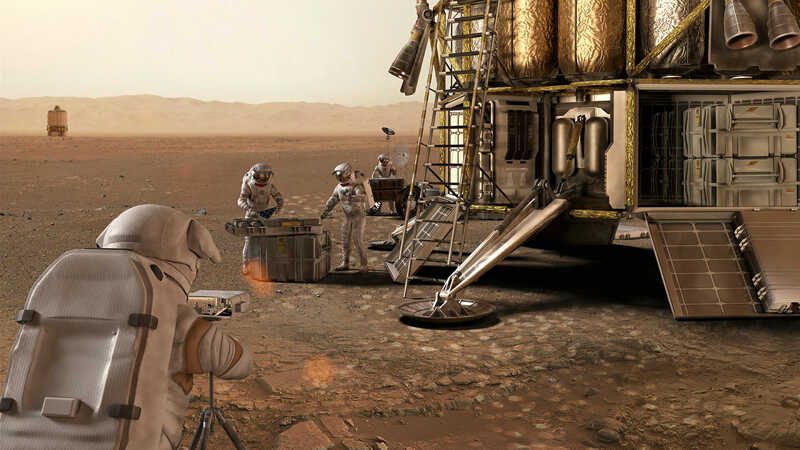 It may sound like a cliché, but decisions made in the coming year could very well determine the path of human space exploration for the next twenty years. Certainly, it is the intention of our entire leadership team at Explore Mars to continue to do everything in our power to assure that humans are walking on the surface of Mars no later than the 2030s. 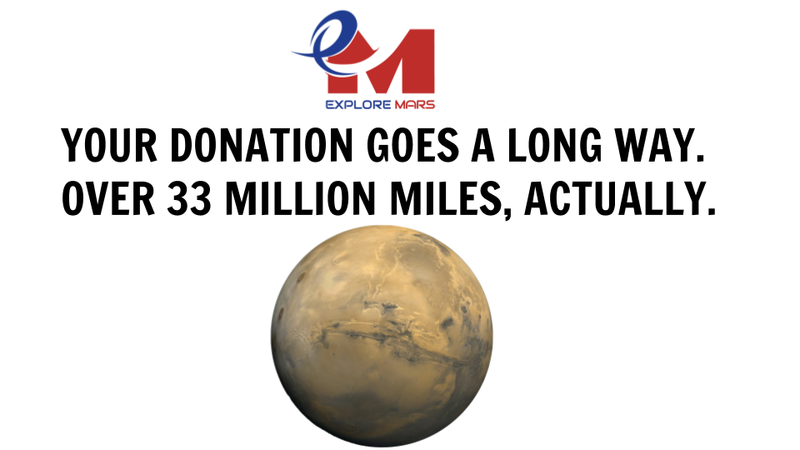 We are neither exaggerating nor bragging when we say that dollar for dollar, Explore Mars is one of the most effective non-profits in the space exploration community. However, achieving our ambitious goals still requires the generous support of dedicated and passionate space advocates like yourself. We would be grateful if you would consider supporting Explore Mars this year with a contribution. I can guarantee that it will have a significant impact on Explore Mars and our mutual cause. Our goal is to raise $50,000 by the end of 2018. Please help us in any way that you can to achieve this goal and to make a real difference. Please feel free to reach out to me or to any of the Explore Mars leadership team if you have any questions. Explore Mars, Inc. has had an extremely busy and productive year, as we continue to expand our already considerable reach and influence among space stakeholders, policy makers, and the public at large. Explore Mars organizes and leads the Space Exploration Alliance’s 2018 Legislative Blitz, an annual grassroots visit to Congress in which over 70 people participated, visiting over 170 congressional offices over two days. Explore Mars displays and presents at Awesome Con and Escape Velocity in Washington, D.C.
2018 Humans to Mars Summit (H2M.ExploreMars.org): H2M is the largest annual conference in the world focused on sending humans to Mars. H2M 2018 featured an impressive lineup of speakers that included members of the United States Senate and House; high ranking Mars mission architecture and science experts; senior international space officials; innovators in virtual/augmented reality, artificial intelligence, and other exciting technologies; prominent members of the entertainment industry; and H2M was the first conference that Jim Bridenstine spoke at after being sworn in as NASA Administrator. 6th Mars Achievability and Sustainability Workshop (AMVI): Explore Mars brings the Mars and lunar communities together to find commonalities in mission architecture and capabilities. Explore Mars organizes and leads the Space Exploration Alliance’s 2019 Legislative Blitz, the annual grassroots visit to Congress.